We are always adding new Vietnam War Pictures to the Vietnam War Gallery, so feel free to head over to the gallery pages to check out the new additions. Some of the new Vietnam War images include unique photographs of battlefield surgery, pet companions during the war, recon plane crash and many more. CLICK HERE to begin your tour of duty through our Vietnam War Pictures Gallery and experience the war through the lens of the men on the ground and in the middle of the action. This picture captures the aftermath of a plane crash involving an L19 reconnaissance plane. 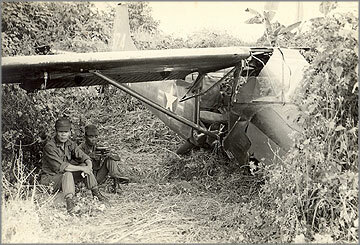 The primary mission of the light reconnaissance aircraft on the Vietnam battlefield was to identify military targets and to communicated coordinates for positioning of air strikes by fighter bombers as well as helicopter gun ships on enemy positions. These single engine light aircraft often flew at extremely low altitudes to spot targets and as a strategy of avoiding large munitions retaliation, but this left them vulnerable to direct small arms fire from enemy ground troops. Wait on our next feature on building projects for beginners. Copyright © 2019 Patriot Duty. All Rights Reserved.